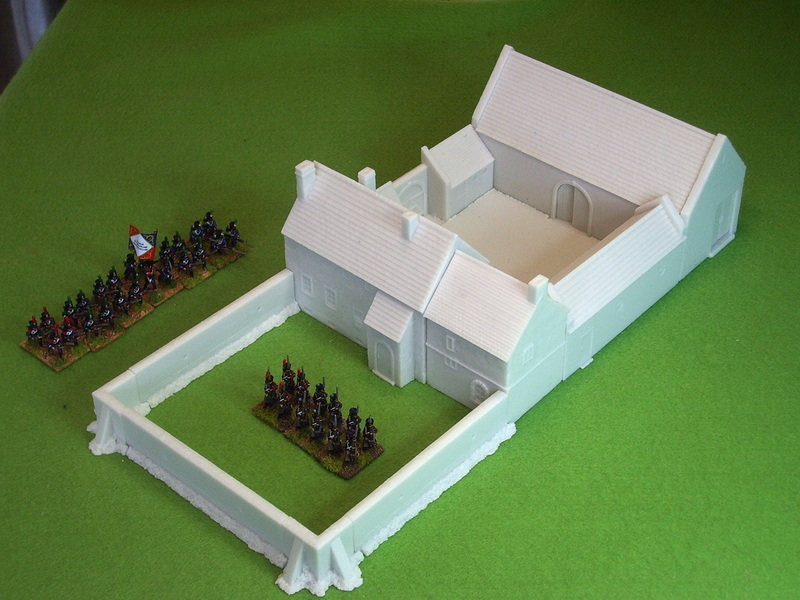 reduced footprint to allow for the whole of the Waterloo battlefield on a manageable size table. periods such WWI & WWII in northern Europe. they are not included in the sale of the model building or terrain piece. A six piece st comprising - Large house, small house, large barn, stable, front gateway wall and courtyard. The barn has a lift off roof, internal floor and 3 pairs of double doors that can be fixed open or closed. 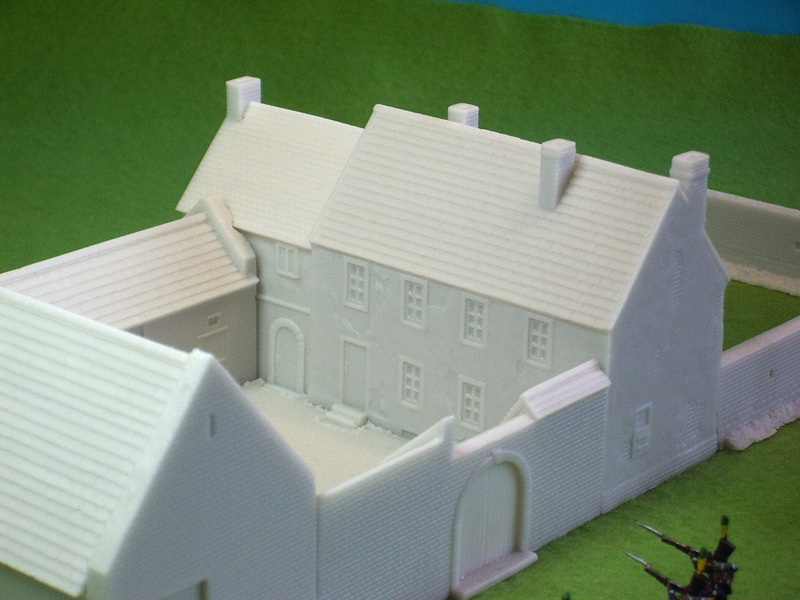 added to Hougoumont to increase the garden for a company level battle. Overall size with the optional garden is 313 x 137 mm. 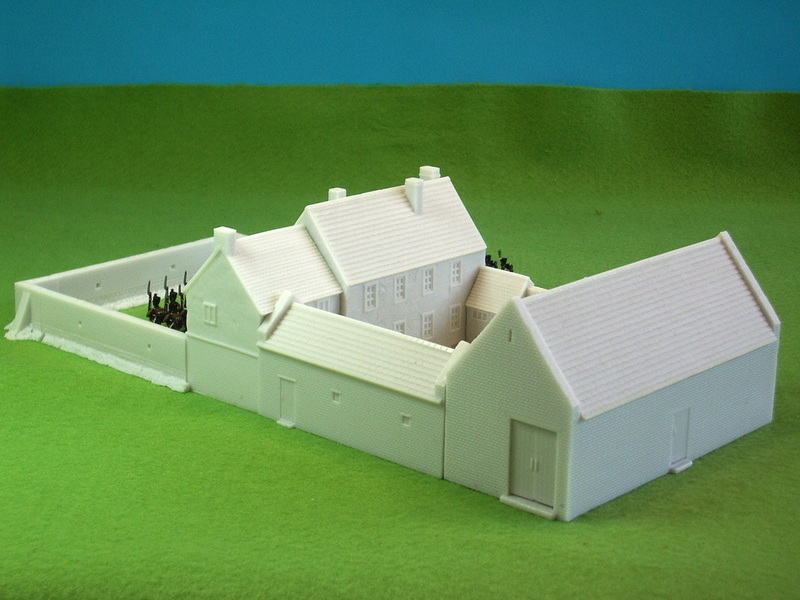 ​Barn from Papelotte code W3B price £16.00 size 138 L x 56 W x 74 mm H.
US infantry figures average height including the base is 18mm. Cast to order. 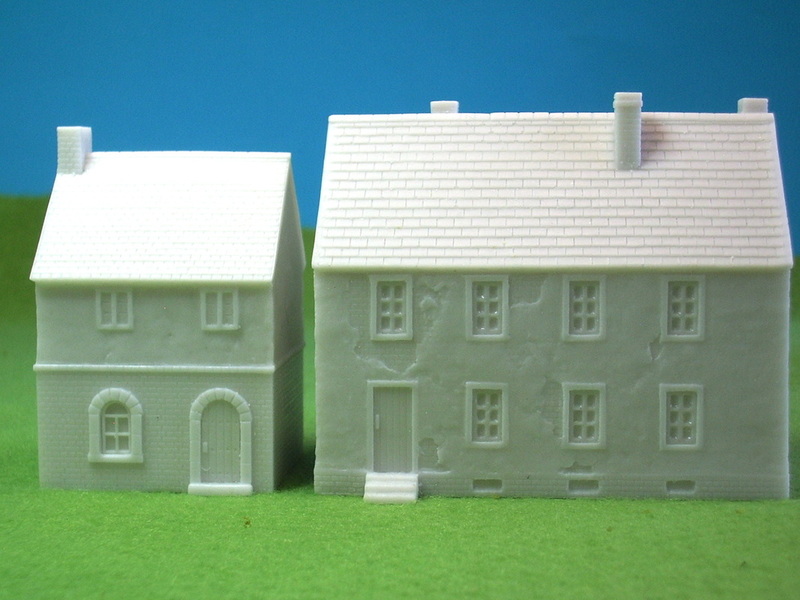 ​Farmhouse from Papelotte code W3F price £9.80 Hollow with fixed roof. 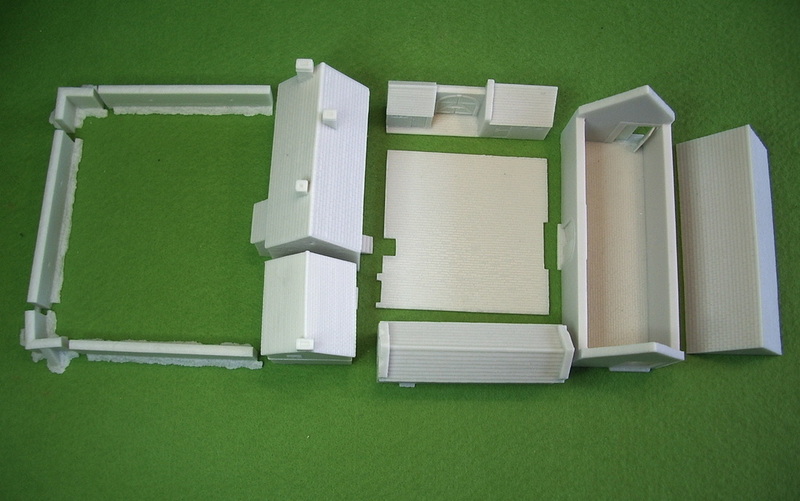 size 91 L x 47 W x 77 mm H, internal 80 L x 36 mm W.
Small House from Papelotte code W3H price £8.00 Hollow with fixed roof. size 47 L x 43 W x 72 mm H, internal 35 L x 33 mm W.
Napoleonic French infantry figures average height to top of shako is 21mm including the base. A new version based on the watercolour painting by Dennis Dighton produced shortly after the battle. Additional detail was taken from an illustration of Inn of La Belle Alliance from George Cruikshank's "Historical Account of the Battle of Waterloo", 1817 now in the British Museum and reproduced in "A Near Run Thing" by David Howarth. Reference was also made to modern day photographs. La Haye Sainte farm set front view. La Haye Sainte rear view. La Haye Sainte front view. La Haye Sainte component parts. Separate main entrance doors front and rear. A four piece set comprising - Farmhouse W5F, Barn W5B with lift off roof and double doors which may be fixed closed or open, Corner Building W5CB and courtyard with front and rear walls with gates that may be cut from the walls & fixed open. Assembled size 142 L x 120 W x 65mm H. All models are supplied unassembled and unpainted. Lift off roof and separate main entrance doors. 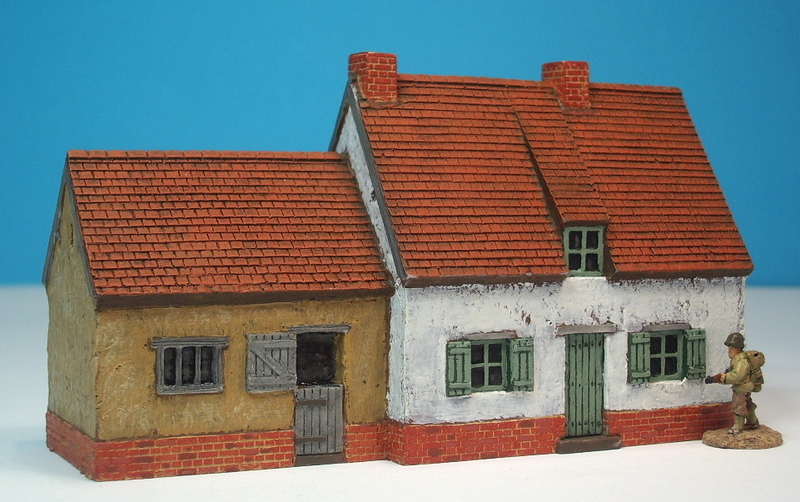 overall size 61 L x 51 W x 40mm H.
A four piece set comprising the chateaux, the south buildings with gateway, the Great barn and the north buildings with gateway. separate beam that may be fixed over the gateway after painting the walls. Overall size (not including garden wall options) 265L x 190W x 84mm H. Garden wall options shown below. French forces attacking the southern gateway. The separate Compact Garden shown to the bottom right. 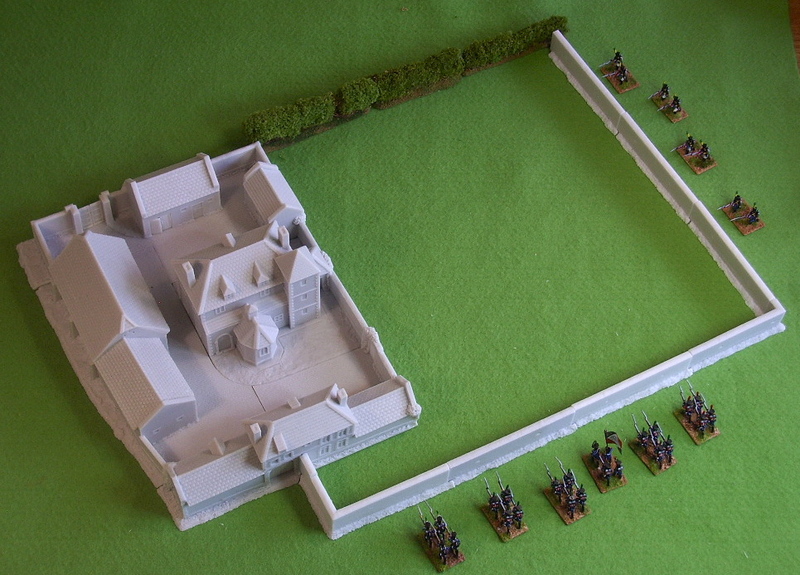 French forces attacking the northern gate. Plan view of the four main pieces and the optional Compact Garden. A minimal representation of the garden using one Long Corner, one Short Corner & three Straight Sections. The same as option 1 but with the addition of two straight sections to the South Wall. Straight Wall Section with two loop holes. May be reversed for variety. The same as Option 1 but with addition of a straight section to the South Wall. Dimensions 268 x 310 mm. The same as option 1 but with the addition of a number of Straight Sections Wat 4SW to be specified by the customer. All models and images are copyright Tiger Terrain 2019.